London is one of the world’s largest cities composed of both born and bred Brits as well as immigrants from around the world as you will soon realize. Because of the influx of immigrants this has become a center of religious diversity. Represented now in the city are many religions and too many individual religious groups to even begin counting. Below is a list of the largest organized religions. The majority of locals are still considered Christian. The 2001 British census results showed that 56% of Londoners consider themselves to be Christian. The vast majority of those Christians are Anglican, the official Church of the UK. The Anglican Church was born in response to King Henry VIII’s disapproval of the Roman Catholic Church. Over half of all the Jews in the UK are living in London. During and after the Second World War there a wave of Jews escaping Hitler move into the city where they have since thrived as a community. Parts of London are still primarily Jewish but most of the Jewish community has integrated into all parts of British life. For centuries Indians have viewed London as their home away from home. It is no surprise then that Hinduism is a thriving religion. Over half of Hindus in the country call this city home. 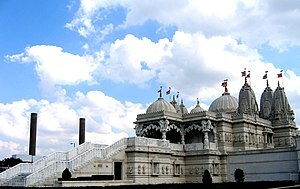 In 1995 a magnificent house of worship for Hindus was built in Naesden called Swaminarayan Temple. A good deal of immigrants to London and the UK are from Muslim nations. As they have moved here and they have brought their Muslim traditions and religions with them. Most local Muslims are from Bangladesh and Pakistan though there are smaller groups from Turkey and other Middle Eastern countries. Around one third of Buddhists practicing in the UK live here. Buddhism is a growing world religion including many citizens from countries where Buddhism dominates as well as native Londoners who have converted. As you can see this is a thriving city deeply steeped in religious traditions. With so many cultures representing all corners of the world it is no surprise to see such an intricate weave of religious expression. While here you are encouraged to take advantage of the diversity of so many different people and experience each of the dominant religions offers.